I've been involved in sports and fitness my whole life. My mother is a personal trainer, and I've played all sorts of competitive sports since I was a young kid. I was always one of the smallest players, so during the summer when I was 15, my mother suggested that I started lifting to put on some size for hockey. I joined the local gym and began to go regularly with my buddies. At first, I had no idea what I was doing. I'd go in, do a couple curls, butcher the bench press, eat a protein bar on the way home, and call it a day. 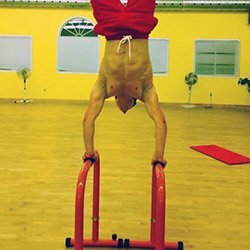 Over time, and with the help of my mom, I developed a better understanding of how to work out properly and began to see some results. I've been hooked on weights since. After that summer, working out became a priority in my life, but only to train for hockey. I played hockey at the AAA and Jr. level. Improving my performance in the gym was important to me. However, my life has really taken some twists and turns in the past year, and my hockey career ended due to personal reasons. Since then, I have found myself and started my bodybuilding journey. "I've failed more times than I can count, and have had to deal with a million things that I've hated. One thing stayed consistent: my passion for fitness." I've had a tumultuous year. In the last 12 months I moved repeatedly, attended the University of Guelph, changed careers several times, played junior hockey, got certified as a personal trainer, and competed in a men's physique show. I also lost my grandfather. After I stopped playing hockey and left university, I was in a dark place. I lost connection with multiple friends, and I was hospitalized for a heart condition. I battled depression, extreme lack of self-confidence, alcoholism, and an eating disorder. I did an excellent job hiding it from everyone, including my family. I never looked for sympathy; that's the last thing I wanted. These challenges and changes allowed me to develop into a stronger person. I've failed more times than I can count, and have had to deal with a million things that I've hated. One thing stayed consistent: my passion for fitness. Deciding to compete in a men's physique show was the best thing that's ever happened to me. I hired my friend's trainer, Angela Hauck. Ange's personality is inspiring; she taught me to look at life with a whole new perspective. Before I met her, I was too worried about trying to impress other people. She taught me not to compare myself to others and made me realize just how important fitness is to me. She is a perfect example of how you have to go after what you want to be happy! Through all of the difficulties I went through this last year, fitness has been a top priority. My ability to make progress on my physique and athletic performance allowed me to push past the pain I've felt in other areas of my life. I'm obsessed with it. I love the gym, nutrition, and living healthy. I can do it every day! There's something so addicting about always being able to better yourself. Fitness is my anchor, and it taught me mental toughness and self-control. That helps me deal with everything else in my life. I'm in a lean bulk phase, and I'm focusing on building my strength and adding quality size. My program is similar to Project Mass on Bodybuilding.com. It puts me on a legs/push/pull split, and I focus on both hypertrophy and strength. As far as cardio, I incorporate a couple HIIT sessions as CrossFit or sprint on a spin bike each week. I perform a dynamic warm-up before each workout and incorporate mobility work to prevent injury and maintain flexibility. Although I'm not training for hockey anymore, I keep my workouts intense and enjoy pushing myself past my comfort zone. There's no better feeling than leaving the gym knowing that you crushed your workout and did everything you could to maximize your training session. Crossfit WOD: Cody's favorite WOD is "Linda"
When I developed my eating disorder, I was paranoid about gaining any fat, so I worked out like a fool and ate less than 1,200 calories per day. I tracked everything religiously on MyFitnessPal and was petrified of going over my macros for the day. As a result, I damaged my metabolism and had an extremely unhealthy relationship with food. However, after deciding to compete, Ange helped me fix my metabolic damage and taught me that I need to eat in order to fuel my body and see results in the gym. I just finished reverse dieting after my show, and I'm now in a caloric surplus. I keep my protein intake high and focus the bulk of my carbohydrates around my workouts. Also, I make sure to have my daily Quest Bar and Golden Oreos. As far as supplements, I pretty much just stick to the basics. I make sure to get my "nutritional insurance" by taking my multivitamin, fish oil, and extra vitamin D every day. From there, I love a good pre-workout before the gym, and drink BCAAs during my workouts to help with my recovery. I make sure to get my 5 grams of creatine post-workout and usually mix it in with my protein shake. I also just started taking Muscletech's Clear Muscle, and will be putting it to the test like they did in their clinical study for the next three months of my lean bulk. "When I decided to compete, I was only 12 weeks out from the show. I trained everyday, twice per day, balls to the wall, and loved every minute of it." I've always had a passion for sports and fitness, but my passion for building my physique emerged in the past year. Before I decided to compete, I proclaimed myself a hockey guy, and never wanted to admit that I loved training to look good. As stupid as it sounds, I thought my friends and family would judge me if they found out I liked to train to be aesthetic. Before my grandfather passed away in the summer, one of the last things he told me was to "live with no regrets." As soon as I got over the fear of expressing what I wanted to do, I caught the bodybuilding bug. By committing to the show, it gave me something to look forward to, and helped dig me out of the major rut I was in. Combined with the support of my new trainer, making progress on my physique helped with my self-confidence and gave me something to look forward to every single day. When I decided to compete, I was only 12 weeks out from the show. I trained everyday, twice per day, balls to the wall, and loved every minute of it. It also forced me to stop drinking alcohol and develop a healthy relationship with food. I enjoyed the whole process. Now I'm proud to say I live the bodybuilding lifestyle. It's my goal to make progress every single day. That keeps me motivated to become my best possible self. I want to go to bed knowing I'm a better person than I was the day before. My grandfather's words motivate me. Whether it comes to fitness, school, relationships, or anything in life, I never want to look back on a day and know I could have put in a better effort. Aside from my grandpa's words, I love watching guys like Maxx Chewning and Christian Guzman on YouTube, and I follow them on social media. They're entertaining, and these two guys have incredible approaches to life. They kill it in the gym and inspire thousands of people who watch them. Their success motivates me to do the same. Their videos also helped me overcome many of my problems. Although I've never met them, I took their advice and perspectives and applied them to my life. Like Maxx and Christian, I look forward to every day. I have the opportunity to work toward my goals and live a fulfilled, happy life. They're both evidence that following your passion and giving it your all can pay off. I hope to meet them in the future! The future looks bright and I have a clear vision of where I want to take my passion. I will graduate university in April, and I want to become an entrepreneur in the fitness industry. It's time to take action and bridge the gap between my dreams and reality! My trainer Ange and I will collaborate and launch a website for our online personal training services this winter. We will help our clients transform more than just their bodies. From experience, we both realize that change starts from the inside out. We want to create an online fitness community and show people how you can use fitness as an anchor to change your entire life for the better. I plan to compete in my second men's physique show next fall, complete a life coach clinic, and gain my Precision Nutrition certification. I also hope to become affiliated with a supplement company that I believe in. It sounds cliché, but one tip I would give other bodybuilders and athletes is that the only person you should try to be better than is yourself, yesterday. You should never spend time worrying about or comparing yourself to others. It's not selfish to think about and work toward your own aspirations. Do what makes you happy! I don't have a favorite bodybuilder. I look up to Steve Cook; he's an amazing physique athlete who also comes from an athletic background. He's aesthetic and functional, and the way he carries himself is fantastic. I'd also consider Maxx Chewning to be another one of my favorite fitness athletes. Although he's a powerlifter, his passion for progress and his outlook on life is inspiring. Bodybuilding.com is essentially my version of a newspaper. I look forward to the new content every weekday! I enjoy reading up on any of the food-related articles and trying out the new recipes uploaded to the massive Recipe Database! I also love reading all workout, supplement and research articles. By keeping up to date with their content, I feel like I'm in the loop, and I constantly learn things I can apply to my daily life! The store is also unreal. I order all of my supplements from Bodybuilding.com. Even though I live in Canada, the prices and promotions can't be beat, and I can expect my order at my doorstep within a couple days! 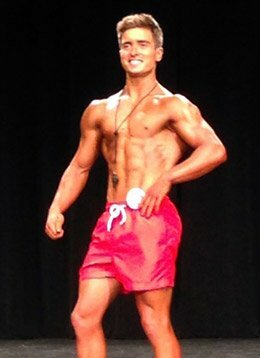 I just completed my first men's physique show. It was UFE Halloween Mayhem in Hamilton, Ontario. I'm planning on competing again in a men's physique show in the fall of 2015.